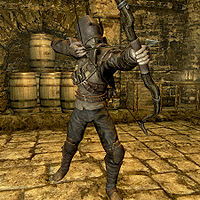 Niruin, a Bosmer thief, is a member of the Thieves Guild and the master trainer for Archery. Before joining the guild, he was a rich wine merchant in Valenwood, but found his previous occupation too boring. Although he claims to be interested in a high-adrenaline life, his daily routine in the Cistern is quite relaxed. After waking up at 10am, he heads over to the cooking spit to make some breakfast. At noon he'll stop and wander around the central area of the Cistern for two hours before heading over to the training room. He will spend four hours there refining his archery skills. He will then loiter around the Cistern until 6am, when he finally calls it a day and heads to his bed, which is just beside the statue of Nocturnal, near the training room entrance. He wears the standard Thieves Guild armor, gauntlets, boots and hood and is equipped with a steel dagger and a leveled bow (up to elven quality) supplemented by 12 leveled arrows. He also carries a belted tunic, 2 lockpicks and up to 18 septims. "Of course you can buy me a drink... you didn't need to say a word, but I heard you loud and clear." "Ugh. The wine in Skyrim tastes like urine compared to the fine vintages we had in Valenwood." "I don't miss home one bit. I'm glad to leave that life behind me." "I'd much rather earn a living liberating others of their coin this way than spending my days as a carpenter like my father." "It's not hard to fit in and make friends when you have the coin to make it happen." "I don't bother with silly pickpocketing jobs when I can make far more at the gambling table." "A lot of people are beginning to get impressed with you here. Me included. Just wanted to let you know." "Interest you in some marksman training?" "If you need marksman training, and you've got the coin... I'm ready to teach you." "Come find me if you need more marksman training." "If you ever need more practice with the bow, just grab me." If you ask him why he joined the guild, he'll lay out his past: "I used to live in Valenwood working at my father's winery... we made the finest wine to ever cross your lips I promise you. We were doing well, plenty of coin, a huge mansion and I was even betrothed to a lovely young woman." If you ask why he left all that behind, he'll say: "Because it was dull. Every day was the same boring routine; working at the winery, social visits with friends, parties with no one I cared about. I just wanted a little excitement. Something dangerous. I hooked up with a guild in Valenwood... I think they called themselves the Silver Crescents. Spent quite a few years doing jobs for them. Made a lot of coin, but I didn't care. I didn't really need it... I was running with them because it fit, made me feel alive. Well, after a while my father caught on to what I was doing. He confronted me one night and gave me a choice. Either leave Valenwood, or he'd have me thrown into jail. Gave me a day to say my goodbyes to everyone. I ended up in Skyrim thanks to a contact I'd made when I was with the Crescents... good old Delvin. He introduced me to Gallus, and that was it. I've been here ever since. And you know what? Despite what I left behind, I don't regret it one bit." If you ask him about the services offered by the guild, he'll give some advice:"If talking your way out of trouble isn't enough, you could always pick up some training from Delvin, Vex or Vipir. Also, I recommend hitting the training room if you need lockpick practice. Helped me out of a jam more than once." During Loud and Clear, he will praise the Black-Briar's mead: "The honey they collect on that hunk of rock goes into making Black-Briar Mead; just about the best tasting mead in all of Skyrim." Before you convince the guild of Karliah's innocence, he'll refuse to speak with you: "What in blazes is going on? Are you working with Karliah?" After though, he'll be enraged with Mercer: "Vex better leave a piece of Mercer for us. It's payback time." Should you get suspended from the guild, he'll refuse to converse with you: "Straighten yourself out with the Guild and then maybe we can talk." Niruin will at times engage in random conversations with fellow guild members, as listed below. Niruin: What in the name of Oblivion is going on in this place? Vipir: Yeah, I know what you mean. If things don't start getting better soon, I may look for work elsewhere. Niruin: Hey, I still have a contact in Valenwood that may have some work for us. You're welcome to join me. Vipir: I'll keep that in mind. Vipir: I tried to fence some goods to Tonilia, and you know what she told me? Niruin: I think I know, but go ahead. Vipir: She said that she barely had enough coin to cover it and I should come back later. Can you imagine that? Niruin: This place is getting worse and worse. Niruin: You seem to be a bit closer to Brynjolf than the rest of us. Is he giving you any idea why this place seems to be falling apart? Sapphire: If he does, he isn't telling me a thing. I've asked, but all I get from him are more questions. Niruin: What about Mercer? Have you asked him? Sapphire: No, and I'm not about to either. I value my life you know... you may want to remember that for yourself. Vipir: How's the training going? Niruin: Better than ever. With the Guild back on its feet, there's more coin to throw around. How about you? Niruin: Let's just hope it stays this way for a long time. Niruin: Hold a moment, Rune. What did you think about my idea? Rune: Your idea to start a brothel, right? Do you want me to tell you exactly what I think? Rune: I think if Brynjolf catches wind of it, he'll boot you right out of here... so drop it already! Niruin: All right. I have everything you asked for all ready to go. Cynric: I hope this deal goes through. I'm putting quite a bit of coin on the line... and the last two you set up fell through. Niruin: I don't understand it either. They were a sure thing, I swear. Cynric: You just better hope this one isn't another waste of my coin. This page was last modified on 29 December 2014, at 17:14.